We provide programs in a comfortable and supportive HIV+ peer-led environment using a health and wellness education model. Our client-centered approach addresses the physical, psychological, and environmental impacts on an individual’s overall health. Our staff understands the barriers and issues faced by people living with HIV/AIDS. Our programs utilize a culturally sensitive, client focused, harm reduction approach. We work hard to ensure each person has unfettered access to the life enriching treatment and support they deserve. 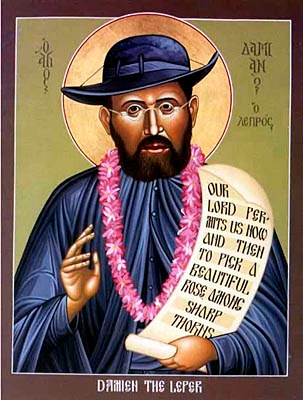 The Damien Center was named after Father Damien, a Catholic Priest who ministered to terminally ill lepers on the island of Molokai, Hawaii in the late 1800’s. Under his leadership, basic laws were enforced, shacks became painted houses, working farms were organized, and schools were established. Leprosy was thought to be very contagious, and thus, ships would come close to the island and toss lepers overboard to swim to the island. Fr. Damien ended up contracting leprosy and died in 1889 at the age of 49.